Tammy Friedrich has been with ACTIVSTARS since 2008. She started out as a parent helper in 2000, initially enrolling her son into Karate to help with his ADHD. Over the next few years she witnessed her son gain focus, self-control and increased enthusiasm. She was one of the first Adults to sign-up for the new adult classes offered through our program. She tested for her black belt at the same time her son was testing for his Brown. 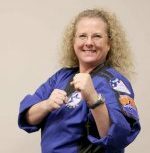 When it was time for her son to test for his Black belt, Tammy had become his Assistant Instructor with ACTIVSTARS. It was an amazing experience being in the Instructor line handing her son his Black belt during the awards ceremony. She has received her Black belt in Shotokan, Aikiedo, and Tae Kwan Do, Karate. In addition to earning her 2nd Degree Black belt in Toushi Kan. She has also earned her Green Sash in Wushu and training for the 3rd Degree in Toushi Kan.
Tammy is proficient in several weapons such as Bo Staff, Escrima, Fan, Chain Whip, Nunchuku and Tri Sectional Staff.